Offers resources on the prevention of child abuse and neglect. Lists who are mandated child abuse reporters and the types of abuse and neglect that must be reported. Explains the Victim-Witness Assistance Program, victim's rights and lists victim centers. Includes resources and advice to help victims find a safe way out of abusive relationships. Assists survivors by explaining the criminal justice process and listing resources for dealing with issues unique to families of criminal homicide victims. Defines hate crimes in California, explains how these crimes are prosecuted and lists resources for victims. 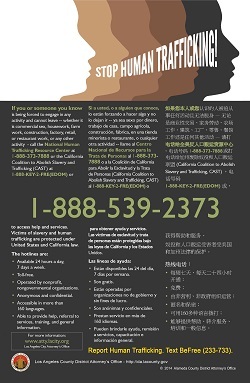 Provides hotline numbers to report human trafficking activity. Describes District Attorney's Office program that provides minor and adult human trafficking victims with specialized services. Highlights certain rights afforded victims under the California Constitution. Offers a basic review of the criminal justice system, defines key legal terms and provides resources for victims and advice for witnesses.